Twenty Seventeen Theme – A new default WordPress theme brings your site to life with immersive featured images, video headers, and subtle animations. With a focus on business sites, it features multiple sections on the front page as well as widgets, navigation and social menus, a logo, a professional responsive design, and much more. Personalize its asymmetrical grid with a custom color scheme and showcase your multimedia content with post formats. Our default theme for 2017 works great in many languages, for any abilities, and on any device. 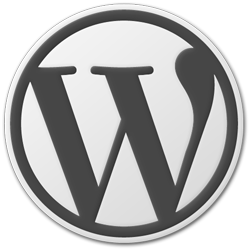 Stay tuned for the next release of WordPress. As always you will see the update notice in your dashboard to update to WordPress 4.7 and enjoy the new features. Take a look at this infographic from Three mobile in the UK, it’s about the speed at which smartphones and mobile technology have impacted our lives – and where we’re headed from here. Three have used current data to predict ways in which mobile technology will change the way we live. Right now over 10 billion products are mobile-connected, and if our predictions are correct, within 7 years, it’ll be five times that amount! Since 2006, the number of internet users has nearly doubled. It makes us wonder what that means for the demographics or users and their experience on the web. You can access the internet from your phone, tablet, or computer, and each experience is different. 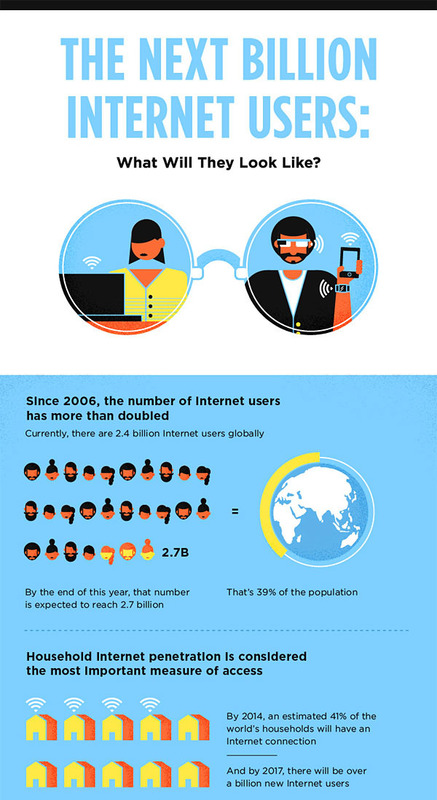 What do the next billion internet users look like? Click the image to access the full Infographic. 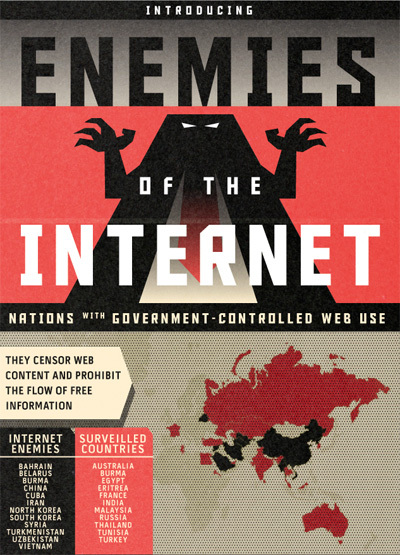 If you think that identity theft is the worst-case-scenario of Internet use, you clearly don’t live in any of the nations that make the list of top “Enemies of the Internet.” Not only do these governments monitor their citizens’ web activity, but they also make it nearly impossible for them to safely share and gather information through anonymous microblogs, Facebook pages or Twitter accounts. Trend of website creation is growing pretty rapidly as people are utilizing web world quite effectively, initially it was quite difficult for people to create website but now it’s simple and easy. Anyone having basic information regarding web can easily set up a website, nowadays the easiest way to set up a website is to obtain Content Management System (CMS). There plenty of FREE content management systems are available, one can easily download and install the desired one on the hosting server and start working. The most common and highly preferred CMS is WordPress, its FREE and open source which means if you do have knowledge about PHP you can easily customize it according to the requirements. WordPress allow easy inclusion of Text, Images and Videos, based on Graphical User-Interface it’s quite easy to manage the different aspects of website. Beside this wordpress offer numerous website themes out of which one can easily pick an attractive one according to the nature of website and if you can’t find an appropriate wordpress theme nothing to worry about as there are countless websites that offer cheap wordpress themes and you can easily sort out the best one. Now the question is how to pick best web hosting for wordpress? All the applications and themes offered by wordpress need proper integration on hosting server for instance it offer social media apps and SEO tools that help webmasters to promote and optimize website but these apps required support on hosting server so that they can function properly. If you are planning to publish wordpress based website than it is highly recommended to choose best web hosting company that ensures total support for wordpress themes and applications. 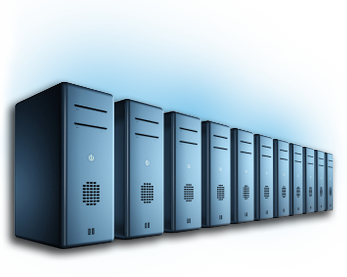 A well reputed web host offer stable and consistent hosting servers and they configure it properly to ensure utmost application support so that people don’t have to face any kind of trouble while installing or configuring any application or theme. In order to be sure of quality hosting service one should consider reading web hosting reviews as they are proven to be useful in terms of web hosting selection. 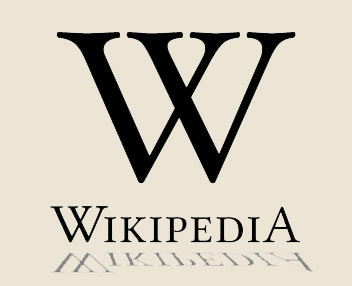 After a 24 hour blackout in protest of SOPA, Wikipedia released the following press release. More than 162 million people saw our message asking if you could imagine a world without free knowledge. You said no. You shut down Congress’s switchboards. You melted their servers. From all around the world your messages dominated social media and the news. Millions of people have spoken in defense of a free and open Internet. For us, this is not about money. It’s about knowledge. As a community of authors, editors, photographers, and programmers, we invite everyone to share and build upon our work. Our mission is to empower and engage people to document the sum of all human knowledge, and to make it available to all humanity, in perpetuity. We care passionately about the rights of authors, because we are authors. SOPA and PIPA are not dead: they are waiting in the shadows. What’s happened in the last 24 hours, though, is extraordinary. The internet has enabled creativity, knowledge, and innovation to shine, and as Wikipedia went dark, you’ve directed your energy to protecting it. We’re turning the lights back on. Help us keep them shining brightly. 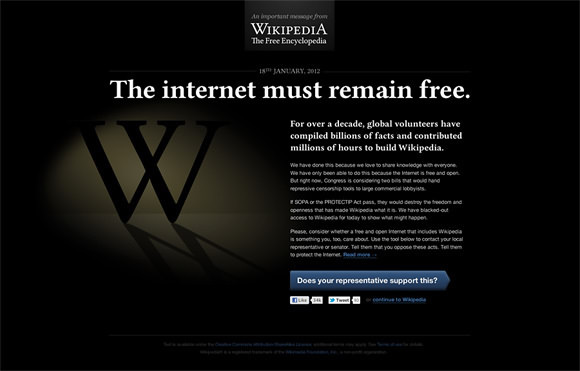 Social news site Reddit and massive online encyclopedia Wikipedia will black out its site on January 18 to protest the controversial Stop Online Piracy Act SOPA bill that is currently working its way through the U.S. House of Representatives. Many other sites are taking a stand with the SOPA movement by blacking out their web site for a 24 hour period on Wednesday, tomorrow. “Instead of the normal glorious, user-curated chaos of reddit, we will be displaying a simple message about how the PIPA/SOPA legislation would shut down sites like reddit,” the blog noted. PIPA, is an acronym for the Protect IPA Act, a U.S. Senate version of SOPA. “A few months ago, many people thought this legislation would surely pass. However, there’s a new hope that we can defeat this dangerous legislation,” the Reddit team wrote. Visitors to Reddit’s site on Jan. 18 will be presented with a live video stream of a hearing by House Committee on Oversight and Government Reform on DNS and search engine blocking. SOPA was introduced in the U.S. House of Representatives by Lamar Smith (R-Va.). It is co-sponsored by John Conyers (D-Mich.), Bob Goodlatte (R-Va.), Howard Berman (D-Calif.) and several other lawmakers. The bill enjoys support from the U.S. Chamber of Commerce and predictable quarters such as the Motion Picture Association of America and the Recording Industry Association of America. It also has garnered wide support from a majority of state attorneys general, law enforcement officials, hundreds of trade unions and industry groups. 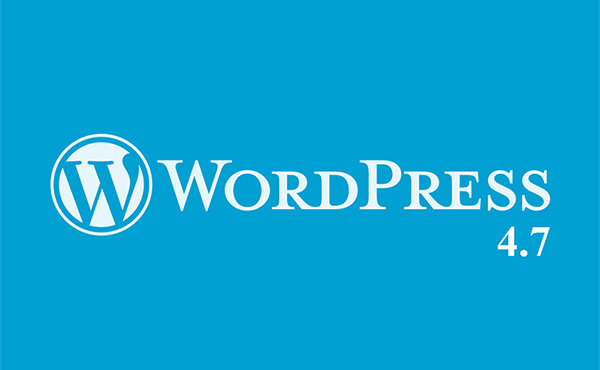 WordPress Testers, Beta 3 of 3.3 is now available! You know the drill: use a test install, see what you can break, and report any bugs you find. There have been 200 commits since Beta 2, but at this point, betas are not adding new features — it’s all about fixing bugs, making things a little prettier, and editing text strings. bbPress version 2.0 RC 5 has been released. 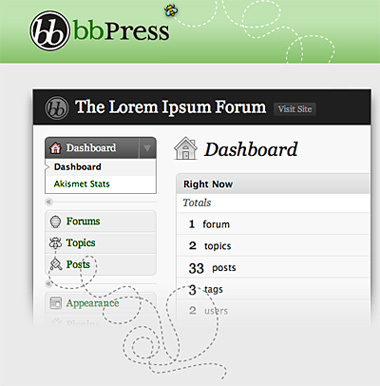 bbPress 2.0 has been making huge leaps over its predecessor with several bug fixes and new features, including highly demanded full integration with WordPress as a plugin. The developers are confident that this is the last release candidate and that it is ready to run on a live site, so if you want to test this out, now’s the time. If you run into any bugs, please don’t hesitate to report them and communicate with other users on the support forums. Here are some new releases and fresh WordPress themes. You can get these themes firectly form the WordPress extend Directory. Enjoy. 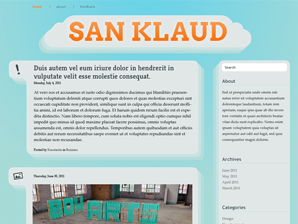 San Kloud is a blogging theme focused on typography and content. Several different color schemes to choose from. 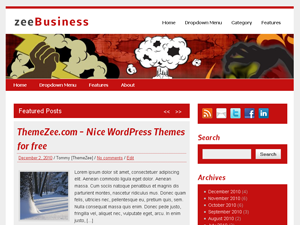 zeeBusiness is a two column wordpress theme in an elegant bold design with strong colors. It comes with three navigation menus (top, main and foot), five sidebar areas (blog, pages, 3x footer) and a Featured Posts Slider. The Allure Pro Real Estate theme for Real Estate Pro plugin powered sites. 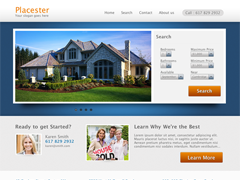 Placester provides all that you need to easily create robust sites for generating leads, professional branding. Easy option menus make it easy to personalize your site, create a network of sites with specific listings focused on niche markets for best results.